I'm new to this forum, and have just made my first laser purchase. On Friday, I ordered the Premium 532nm +175mW Green Laser from Optotronics.com. The order came to US $224.17, which includes USPS Priority Mail (With Insurance). I'm looking forward to receiving the laser, and will make a video and stills with my smartphone, and review the laser on this forum. Put your global location in where you join date is , and tell us about yourself to get to know you and help you better..And What wave length is your pointer , post some pics of it when you receive it. Very nice laser you ordered. Beware of the duty cycle and I wouldn't run it more than 45 seconds before a few seconds of cool down..Also these DPSS don't run to well when its cold out and its cold in NYC now! !, so don't be dissapointed till you figure out its likes and dislikes.. I will update my bio details. Yeah, it's cold as the arctic here in NYC today, and I will factor the low temps in when testing my new laser. In the future, if you have multiple posts that follow one another, it's best to combine them instead of double posting. That's an expensive 175 mW 532nm laser module. Or, is it a completed laser? At any rate I wonder if it has an IR filter, or the optical power includes some infrared. If the crystals get too cold they tend to try to laser at lines other than 532nm. I think one of them is 530nm. I would expect a good TEM00 longitudinal beam for that price at room temperature. towards the +175mW total of 532nm. I'd stock up on AAA batteries. You'll be changing them often. It is a pen style at 6.3 inches long. I'll bet it looks like those eBay pens you can get for ~$2.00 with a black rubber finish. I have a good supply of rechargeable AAA batteries. Optotronics has a solid rep, and builds top quality lasers in the USA. Not sure a comparison with a $2.00 piece of Chinese junk on eBay is fair or apt. Optotronics lasers are expensive, but they seem to be much higher quality than the cheap Chinese pens, they're based here in the US, and Jack is great to deal with, he's also a member here. A high quality product, plus US based, is very important to me. It's disheartening witnessing the rarity of US based Laser pointer companies. They are a US company (Mead, Co.), but I'd imagine that the pointers are still assembled in China, probably to Optotronics specs though. I wanted a pen laser for my first purchase, and yes cosmetically they are similar to each other. 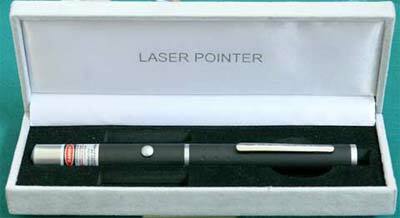 Of course, I didn't buy this specific pen laser for its atheistic value, but for its performance and quality parts. Thanks for the battery tips.